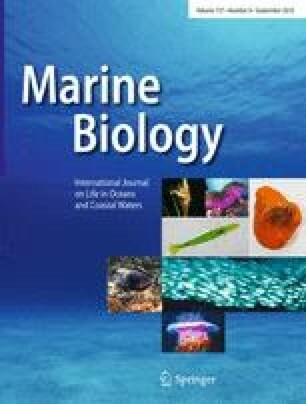 Effects of temperature and body mass on metabolic rates of sprat, Sprattus sprattus L.
Sprat, Sprattus sprattus L., is a small schooling clupeid forming large stocks in several ecosystems. Despite its high trophodynamic impact, little is known about its energy consumption rates. As a central component of a bioenergetic budget, metabolic rates of sprat from 3.11 to 9.71 g wet weight (WW) were measured at nine different temperatures (T) ranging from 9 to 21°C using a computer-controlled intermittent-flow respirometer. Routine metabolism (R R) was related to T (°C) and WW (g) by R R = 0.074 WW1.077 e0.080 T. Standard metabolic rates (R S) as calculated from the 10% percentiles of the repeated measurements were on average 12% lower and still influenced by continuous swimming activity: R S = 0.069 WW1.073 e0.078 T. We interpret the deviation of the scaling exponent b from typically found exponents of b ~ 0.8 as a consequence of permanently elevated activity level. The high permanent swimming activities also indicated that the concept of standard metabolism may not be meaningful in schooling planktivorous fish. These results suggest that generally in bioenergetic models for clupeid schooling fish the activity multipliers should be chosen very conservatively. We thank S. Stäcker for his assistance with all experiments and the maintenance of fish in the aquarium. We also like to thank M.A. Peck for his comments on earlier versions of the manuscript. Two anonymous referees provided helpful comments that improved the manuscript.